Lynn Fitzgerald was fortunate enough to escape the foster care system, yet the difficulties she faced as a child, were not easily forgotten. 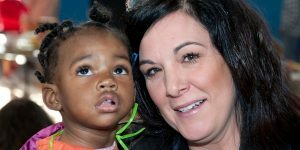 She founded the children’s literacy non-profit, Turnaround Toys, to bring comfort to children facing similar circumstances. Lynn came up with the idea for Turnaround Toys after noticing how many toys most children have, and how quickly they grow out of them. Because toys are an essential part of childhood, Lynn wanted to find a way to give these extra toys to disadvantaged children who don’t have many or any toys at all. In the early days of Turnaround Toys, Lynn grew the organization mainly by word of mouth and pounding the pavement asking for monetary donations or other gifts. 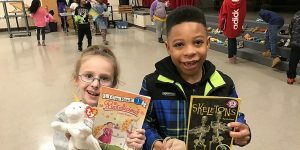 As her organization evolved, Lynn wanted to take her efforts a step further by working to promote childhood literacy through a reading buddy program that incorporated the donated toys. Turnaround Toys focuses on promoting literacy by putting a fun twist on the traditional reading buddy model. Children receive stuffed animal reading buddies plus a selection of books and are encouraged to read these books aloud to their reading buddy each night. This activity helps the children become more comfortable reading aloud by giving them the confidence to not skip over words they don’t understand. The new focus quickly gained popularity, leading Lynn to set her sights on even more ambitious goals. She began to discuss the challenges of scaling the non-profit with board member, Frank Coviello. Frank and Lynn realized that their most glaring hurdles were their lack of a professional, online presence in a such a digitalized world, and the ability to accept online payments. Initially, Turnaround Toy’s went with a well-known payment processor, but their relationship was short-lived, due to limited reporting capabilities and support resources. They quickly realized they needed a more robust platform that placed an emphasis on customer care. Frank and Lynn researched other methods of accepting online payments and after just a few Google searches, noticed PaySimple was one of the top recommendations alongside PayPal and Square. After vetting PaySimple through their professional networks, scouring review websites and carefully combing through the site, Lynn and Frank decided to set up their donation portal with PaySimple and haven’t looked back since! PaySimple’s online store allows Turnaround Toys to have a much more accessible means of collecting donations. Potential donors can now view their website, read more about Lynn’s mission, and donate all online. Donors can choose from both a one-time donation or monthly recurring donations which, Frank says, has dramatically boosted monthly revenue. “PaySimple’s online store allows us to quickly and easily take online payments, and helped grow our charity immensely. We are now able to focus on new ways to expand the organization and reach more kids throughout the United States,”said Frank. Future goals include scaling online fundraising, and engaging local communities through school partnerships and community literacy events. Their ultimate goal is to have a house in each state where kids from low income areas can come to learn and read. PaySimple will be on their side every step of the way. If you or someone you know wants to donate or volunteer, visit the Turnaround Toys website: www.turnaround-toys.com or contact their office at 704-999-8282.